See how IBM MQ Advanced seamlessly connects data to help you move in real-time and serve customers better. Learn expert tips and techniques to make your install go smoothly in this step-by-step demo. Discover how to use MQ V9 to your company's best advantage. Get expert tips and techniques on Advanced Message Security. 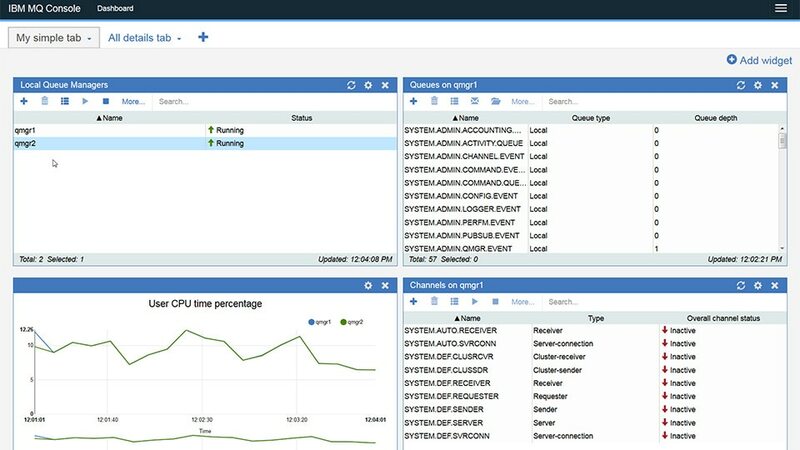 View charts showing performance measurements to present the performance characteristics of the IBM MQ Appliance. Evaluate the potential financial impact of deploying IBM MQ for message-based connectivity between business applications. Learn how the new AMS confidentiality mode provides security for your message payload whether in transit or at rest. Read an overview of enterprise-grade messaging and its various deployment options in private, public or hybrid cloud. Learn more about the market-leading flexible and reliable hybrid messaging solution for on premises and the cloud. Learn how the advanced integrated messaging of IBM MQ can seamlessly connect your enterprise. Combine the scalability and security of IBM MQ with the simplicity, convenience and lower cost of an appliance. Learn about the new features of IBM MQ V9 and how they deliver improved scalability, security and usability. See how you can create a queue manager within minutes, how IBM Cloud enables zero-effort maintenance and more. See why avoiding a single point of failure is essential, and planning for system failure can ensure business continuity. Explore the updates to the IBM MQ family over the last 12 months and get a glimpse into where we’re going. Deploy fast and use fewer administrative and infrastructure resources than multiple messaging servers.